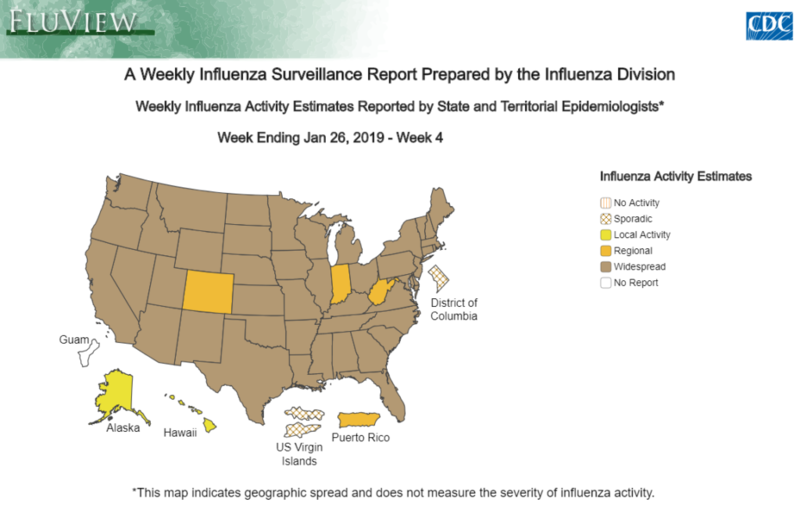 Influenza-like Illness Surveillance: For the week ending Jan. 26 (week 4), the proportion of people seeing their health care provider for influenza-like illness (ILI) increased from 3.3% to 3.8%, which is above the national baseline of 2.2%. The highest ILI so far this season was 4.0% during the week ending week ending Dec. 29, 2018. 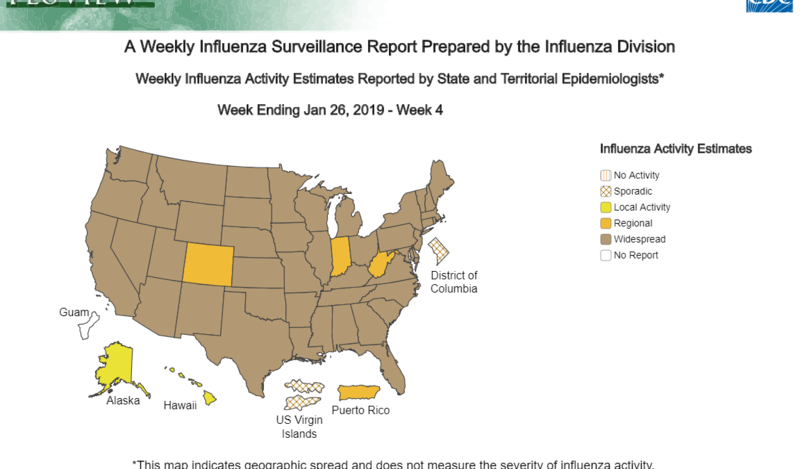 Influenza-like Illness State Activity Indicator Map: The number of states experiencing high ILI increased from 18 states plus NYC to 23 states plus NYC. The 23 states are Alabama, Alaska, Arkansas, Colorado, Connecticut, Georgia, Indiana, Kentucky, Louisiana, Maryland, Massachusetts, Mississippi, Nebraska, New Jersey, New Mexico, North Carolina, Oklahoma, Rhode Island, South Carolina, Texas, Utah, Vermont, and Virginia. Puerto Rico and 10 states (Arizona, Hawaii, Kansas, Minnesota, Missouri, New Hampshire, New York, Pennsylvania, West Virginia, and Wyoming) experienced moderate ILI activity. The District of Columbia and 13 states (California, Florida, Idaho, Illinois, Iowa, Maine, Michigan, Nevada, Oregon, South Dakota, Tennessee, Washington, and Wisconsin) experienced low ILI activity. 4 states (Delaware, Montana, North Dakota, and Ohio) experienced minimal ILI activity. Data was insufficient to calculate an ILI activity level for Puerto Rico. Additional data, including data for previous seasons, can be found at https://gis.cdc.gov/grasp/fluview/main.html.